Draft: 1999, Los Angeles Dodgers, 6th rd. Married to Melissa...The couple has a daughter, Kali'a Makenna (3/30/07), and a son Kingston Shane (9/30/10), and he has 1 stepson, Keenan (10/1/95). Was a 1999 graduate of St. Anthony's High School (HI)...Was an all-star the football, soccer, baseball, and track teams. Appeared in an episode of CBS' Hawaii Five-0 in 2012. His biography, Shane Victorino: The Flyin' Hawaiian was published in March of 2011. Limited to 30 games for the Red Sox due to 3 stints on the DL with 2 different injuries...Had season-ending back surgery on 8/5...Hit right-handed all season...Batted .325 (13-for-40) with a 2B, HR, and 7 RBI against left-handed pitching, compared to .241 (20-for-83) with 5 2B, 3B, HR, and 5 RBI against righties...His 30 games, 33 hits, 123 AB, 2 HR, 12 RBI, and 2 SB were all his lowest marks since his 1st season with PHI in 2005...Placed on the 15-day DL prior to the season opener on 3/31 (retro to 3/30) with a right hamstring strain...Played a 3-game rehab stint with Triple-A Pawtucket from 4/19-22...Activated from the DL on 4/24 and made season debut for BOS that night vs. NYY, going 1-for-5 with a 2B...Appeared in 21 ML games from 4/24-5/23 between DL stints (.242, 22-for-91, 5 2B, 3B, HR, 10 RBI), all in RF...Went 4-for-4 with a 2B and 2 RBI on 4/29 vs. TB, the 1st time he had a hit in all of at least 4 AB in a game since 7/25/09 vs. STL with PHI (4-for-4)...Drove in a season-high 4 runs on 5/10 at TEX (3-for-4)...Placed on the 15-day DL on 5/24 with a right hamstring strain...Went 3-for-27 over a 10-game rehab stint between Short-A Lowell (4 G) and Triple-A Pawtucket (6 G)...Activated from the DL on 7/19 and hit safely in each of his first 6 games back with BOS from 7/19-25 (.435, 10-for-23)...Placed on the 15-day DL on 8/1 (retro to 7/31) with a lower back strain...Underwent successful season-ending lumbar discectomy surgery on 8/5...It was performed by Dr. Robert Watkins at Marina Del Rey Hospital in Los Angeles, CA...Transferred to the 60-day DL on 9/8. to record double-digit sac hits (also Darnell McDonald in 2010 with 12). Was successful in 21 of 24 stolen base attempts for an 87.5 SB percentage, 5th best in the AL (min. 20 attempts). Became the 1st ever Red Sox to collect at least 10 sacrifice hits, 15 homers, and 20 stolen in a season...Was the 1st in MLB to do it since NYY's Derek Jeter in 2004. Was the 7th-harded AL batter to double up (95.4 AB/GIDP, 5 GIDP). Finished 7th among AL leaders with a .322 home AVG (75-for-233). Switch-hitter batted .310 (15-for-268) with 12 of 15 home runs while batting right-handed...Hit .273 (57-for-209) batting lefty. Hit .300 with 6 home runs batting right-handed vs. RHP...Primarily hit right-handed against righty hurlers from the 3rd inning on 8/4 vs. ARI through the remainder of the season...Also had 3 right-handed PA against RHP R.A. Dickey on 4/7. Tied for the ML lead with 3 game-winning RBI in extra innings, the most in a season by a Red Sox since David Ortiz had 3 in 2006. Hit .406 (26-for-64) with 8 doubles, 4 homers, and 12 RBI in 16 games vs. the NL, including 9 multi-hit efforts... Was the 3rd-best Interleague AVG in MLB. Made a career-high 106 starts in RF and his 110 games at the position was the 2nd-highest total of his career (114 in 2007 with PHI)...Also made 11 starts in CF (15 G). T-6th in the AL with a team-leading 10 outfield assists...His 9 assists from RF tied for the AL lead and marked the most by a Red Sox RF since Trot Nixon in 2005 (9). Became the 1st player to reach double digits in home runs, stolen bases, sacrifice hits, and outfield assists since BAL's Brady Anderson in 1992 (21 HR, 53 SB, 10 SH, 10 OA)...Was the 1st ever Red Sox to put together that particular quadruple-double in a season. According to Fangraphs, led all AL outfielders in Ultimate Zone Rating (24.0). During Spring Training, played for Team USA in the World Baseball Classic. Made 7th straight Opening Day start on 4/1 at NYY, with the previous 6 coming with the Phillies...Was his 2nd Opening Day start in RF (also 2007) after 5 straight in CF (2008-12). Hit a walk-off infield single in the 10th inning on 4/13 vs. TB, his 5th career walk-off hit. Missed 7 games from 4/25-5/2 due to low back tightness...Had also missed both ends of the Sox' 4/21 doubleheader with the same injury. Left in the 6th inning on 5/20 at CWS with left hamstring tightness and placed on 15-day DL on 5/24 (retro to 5/21) with a left hamstring strain...Appeared in 1 rehab game for Triple-A Pawtucket (2-for-4, HR) before being activated on 6/8. Hit .297 with 13 of his 15 home runs and 51 of his 61 RBI after coming off the DL on 6/8. Collected a season-high 4 hits and matched a then-career high with 5 RBI on 6/21 at DET. After the All-Star break, ranked 2nd on the Sox with 37 RBI (David Ortiz, 38) and T-2nd with 11 home runs (Mike Napoli, 12; Ortiz also 11). Had a .321 AVG (63-for-196) with 13 doubles, 10 HR, and 33 RBI over his final 49 games beginning 7/30...In that time, led the Sox and ranked among AL leaders with a .541 SLG (4th), .932 OPS (3rd), and 106 total bases (T-10th). Reached in 26 of his last 31 games with a PA, batting .341 (42-for-123) 8 2B, 8 HR, 24 RBI, 4 BB, and 11 HBP. Ranked among AL August leaders while leading the Sox in home runs (T-6th, 7), RBI (4th, 22), runs (2nd, 24), hits (3rd, 38), XBH (T-6th, 15), total bases (3rd, 67), and SLG (11th, .578)...The 7 homers (tied, also July 2008 with PHI) and 22 RBI were single-month career highs. Named AL Player of the Week for 7/29-8/4, his 1st career weekly award...Batted .433 (13-for-30) with 3 2B, 2 HR, 7 RBI, BB, 2 HBP...Led the AL with 21 total bases. Tallied a game-winning, 2-run single with 2 outs in the 11th on 8/13 vs. TOR...Also threw out Jose Reyes at the plate in the 6th inning of that game. Collected a career-high 7 RBI on 8/27 vs. BAL, going 3-for-3 with a double, 2 homers, a walk, and a HBP...Was the most RBI by a Red Sox since J.D. Drew had 7 on 6/8/07 at ARI, and tied for the most in a game in the majors all year...Was the 1st Red Sox with 7 RBI and 4 runs scored in a game since Dwight Evans on 8/13/88 vs. DET (7 RBI, 4 R)…Was the 1st player in franchise history to go 3-for-3 or better with at least 2 homers, 4 runs, and 7 RBI (Elias).Drove in the winning run at NYY on both 9/5 (8th-inning 2-run homer, his 2nd HR in as many games off Preston Claiborne) and 9/6 (10th-inning RBI single off Rivera). On 12/16, underwent successful nerve release surgery on his right thumb, performed by Dr. Thomas Graham in Cleveland, OH. Played 14 games, all starts, during the Red Sox' run to the World Series title…Hit .216 (11-for- 51) with 2 doubles and 2 walks…His 12 postseason RBI ranked 2nd on the team, 1 shy of David Ortiz (13)… Drove in the game-winning run in all 3 postseason clinchers, the most by a player in a single postseason…Was hit by a pitch 7 times, the ML record for a single postseason…Hit safely in all 4 ALDS games vs. TB and set a DS record with 4 HBP...T-1st among 2013 DS batters with a .556 OBP (min. 10 PA)...Put the Sox ahead for good with a 2-out RBI infield single in 7th inning of the deciding Game 4 at TB…Started all 6 ALCS games vs. DET…Knocked a game-winning grand slam in the 7th inning of the clinching Game 6 of the ALCS vs. DET off Jose Veras, his 2nd career postseason slam (also G2 of 2008 NLDS vs. MIL off CC Sabathia)...Played the first 3 World Series games vs. STL…Scratched from the Game 4 lineup due to lower back tightness and did not play in Game 5...Returned for the final contest, a 6-1 victory in Game 6, going 2-for-3 with a double, 4 RBI, and a walk…Put the Sox on the board with a bases-clearing 3-run double in the 3rd inning…Also had a bases-loaded single in the 4th inning. Split the season between the Phillies and Dodgers following a trade to LAD on 7/31.Had a career-high 39 stolen bases between both clubs which ranked 4th most among all NL players.Finished tied for 6th among NL outfielders with 9 assistsWas 10th-hardest hitter in NL to strikeout, averaging 8.33 plate appearances per strikeout (666 PA/80 SO).Made his 6th straight Opening Day start in the outfield for the Phillies (5th straight in CF).Reached base safely in his 1st 11 games of the season (.362 OBP), including a 10-game hitting streak, 4/7-17(.325, 13-40, 2B, HR, 3 RBI).Had a season-high 5 RBI, 6/8 at BAL.Picked up the 1,000th hit of his career with a single off Matt Cain, 7/21 vs. SF.Committed only 2 errors on the season and had a streak of 273 games (269 starts) without an error snapped,7/28 at ATL with his 1st error since 8/14/10 at NYM...Was the 3rd-longest active streak behind Franklin Gutierrez(296) and Andre Ethier (282). Acquired by LAD (NL) in exchange for RHPs Josh Lindblom and Ethan Martin and a player to be named later (INF Stefan Jarrin) on 7/31. Was voted onto the NL All-Star team via the Final Voteon MLB.com (did not play in game); his 2nd All-Starselection...Tied for the NL lead in triples (16), T-4th in SB % (86.4)and T-7th in runs (95)...Was the 9th-hardest batter to strike out in the NL(1 SO/9.3 PA)...Had his 3rd career quadruple double (double digits in2B, 3B, HR and SB), becoming the only NL player toaccomplish the feat for the season...Did not commit an error all season to lead all NL centerfielders in fielding % (1.000, 296 TC)...Made his 5th consecutive Opening Day start (2007-11)and 4th in CF...Hit his 1st career inside-the-park HR, 4/24 at SD (WadeLeBlanc)...Got his 150th career SB, 5/5 vs WSH...Was on the 15-day DL, 5/20-6/2 (retroactive to 5/19)with a right hamstring strain; originally left the game,5/14 at ATL, in the bottom of the 8th inning with righthamstring soreness...Had his second 15-day DL stint, 7/8-18 (retroactive to7/4) with a right thumb ligament sprain after originallyinjuring it on 7/3 at TOR...Slugged his 1st career extra-inning HR, 8/1 at COL (10th),to give the Phillies the lead and eventual win...Served a 2-game suspension, 8/18-19, for his actionsduring a bench-clearing incident on 8/5 at SF...Of his 17 HR, 6 gave the Phillies a lead and 2 tied thegame...Was presented with the Mike Schmidt Player of the YearAward by the Philadelphia chapter of the BBWAA. Won his 1st NL Rawlings Gold Glove after finishing 4thamong NL center fielders in fielding % (.994; 2 errors in323 TC) and T-4th in assists (7)...Finished 3rd in the NL in infield hits (34), 5th in triples(8), 6th in SB (36), T-6th in bunt hits (9) and T-8th inmulti-hit games (50)...Set career highs in avg (.293), hits (167), at-bats (570),runs (102), doubles (30), HR (14), RBI (58), walks (45),total bases (255) and multi-hit games...Made 134 starts in CF and 4 in RF...Placed on the 15-day DL, 4/13 (right calf strain); playedin 5 rehab games before being activated on 4/29...His 7 HR in July were a career best for one month;previous high was 5 HR in June 2007...Had 8 HR and 17 RBI over an 18-game span, 7/12-8/5...Had a career-high 4 RBI, 7/1 at ATL & 7/27 vs ATL...Scored a career-high 4 runs, 5/26 vs COL...Had a career-high 2 triples, 6/6 at ATL...Tied his career high with a 14-game hitting streak, 5/19-6/2 (.400, 24-60, HR, 7 RBI)...Had his 1st career multi-HR game, 7/12/08 vs ARI...Batted .359 (42-117) leading off an inning...Hit .462 (24-52), 5 2B, 3B, 3 HR, 6 RBI over his final 13games of the season...Set a Phillies record with 13 RBI in the postseason;T-2nd among all major leaguers in 2008 playoffs(TB's B.J. Upton - 16)...Clubbed the 1st grand slam in Phillies playoff historyin Game 2 of the NLDS (CC Sabathia)...Became the 3rd player in team history to collect 4 RBIin an LCS game, 10/10 vs LAD...Hit a game-tying HR in the 8th inning of Game 4 of theNLCS (Cory Wade). Was the Phillies' Opening Day right fielder... Set career highs in starts (101), at-bats (456), runs (78),hits (128), doubles (23), home runs (12), walks (37) and stolen bases (37)... Finished 6th amongNational League players in steals, 4th in SB % (90.2) and T-6th in outfield assists (10)... Scored 23 runs in May, 2nd-mostamong NL players (FLA's Dan Uggla - 24)... Had 3 consecutive multi-steal games, 5/3-5 at SF, becoming the 1st MLB playerto do so since 1997 (CLE's Omar Vizquel) and 1st Phillie since 1982 (Bob Dernier)... Scored a run in 6 straight games, 5/25-5/30 (10 runs total)... Hit his first career walk-off home run, 6/3 vs SF, which was also Shane Victorino Hula Figurine Day atCitizens Bank Park... Had a career-best 14-game hit streak, 6/7-22 (.311, 19-61, 3 HR, 7 RBI)... Tied his career high with 5 hits,7/17 at LAD... Had 32 multi-hit games, including 11 with at least 3 hits... Stole 26 consecutive bases, 5/18-7/13, the longeststreak by a Phillie since Jimmy Rollins stole 35 straight in 2001... Had 6 multi-steal games... Suffered a right calf strain, 7/30at CHI and was on the 15-day DL on 7/31... Hit .273 (3-11) in 3 rehab games with Reading (AA) and Lakewood (A)... Wasactivated on 8/22... Hit .307 (70-228) with 30 RBI on the road... Hit .318 (21-66), 13 RBI in "close and late" situations... Hit.340 (35-103) with 10 multi-hit games in 24 July games and after hitting .248 (27-109) in 28 June games. Led the team in sacrifices (8) and OF assists (11)...Did not commit an error this season in 232 TC...Finished 6th in the NL in OF assists and T-6th in HBP (14)...Hit .412 (21-51) through his first 35games...Was the only Phillies OF to make starts at all 3 OF positions: 60 in CF, 17 in RF and 3 in LF...Had hits in 7 consecutiveat-bats, 5/11-13, becoming the first Phillie to do that since Jimmy Rollins in 2002 (8/10-11)...Hit .339 (20-59), 4 2B, 3B, 2 HR,7 RBI playing every day in place of CF Aaron Rowand who was on the 15-day DL, 5/12-26...Had his first career 4-hit game,5/12 at CIN...Moved into an everyday role following the trade of RF Bobby Abreu on 7/31...Batted .345 (50-145) over a 36-game span, 8/2-9/9...Reached base safely in 23 straight games, 8/21-9/14 (.411 OBP)...Collected a career-high 5 hits, 9/29at FLA, the most by a Phillie in 2006...Batted .370 (17-46) in his final 9 games of the season...Hit a combined .329 (74-225),2 HR, 28 RBI vs the NL East. Named International League MVP after batting .310 with 25 doubles, 18 homers and 70 RBIs. ... Hit his first Major League homer on Sept. 22 at Atlanta. Reached professional highs in HR (19) and RBI (63)...Began the season with Las Vegas(AAA)...Hit .296 (21-71) in his final 23 games with the club before being transferred to Jacksonville (AA) on6/9...Led Jacksonville in homers (16), runs (70) and triples (7), despite playing only 75 games...Slugged 2 HR, 6/15vs Carolina...Batted .409 (18-44), 2 2B, 2 3B, 2 HR, 8 RBI in a season-best 10-game hitting streak, 6/23-7/2...Hit.408 (40-98) in August...Overall, hit .293, 19 HR, 63 RBI, 98 R in 130 games...Played for Zulia in the VenezuelanWinter League...Selected by Phillies in MLB's Rule 5 draft, 12/13. Began season with SD ... Made 17 starts: 11 in CF, 5 in LF and 1 in RF ... Made his ML debut, 4/2 vs SF, as a pinch-runner ... Collected his first ML hit, 4/20 at COL (Shawn Chacon) ... Was returned to LA on 5/28 and assigned to Jacksonville (AA) ... Stole a season-high 3 bases, 6/24 vs Orlando ... Promoted to Las Vegas in August ... Went 5-for-5, 8/28 at Fresno. Played for Jacksonville (AA) ... Ranked 2nd in the Southern League and led all Dodgers minor leaguers in steals (45) ... Appeared in 67 games in RF and 58 games in CF ... Had a season-best 13-game hitting streak (.417, 20-48, 3 RBI) ... Hit .355 (54-152) vs LHP ... Hit .330 for Arizona Fall League champion Peoria ... Selected by SD in MLB's Rule 5 draft. Began season with Wilmington (A) ... Had 38 multi-hit games ... Scored 13 runs in 8 games, 5/18-26 ... Batted .407 (22-54), 1 HR, 10 RBI in a season-best 13-game hitting streak, 7/14-26, raising his average from .272 to .291 ... Won LA's Minor League Player of the month honors for July ... Appeared in 70 games in CF, 31 in RF and 8 in LF. Spent season with Yakima (IND) ... Led club in steals (21) ... 1999: Spent first pro season with Great Falls (A) ... Led the club in steals (20) ... Named the Fastest Baserunner in the Dodgers organization by Baseball America. May 23, 2016 Iowa Cubs released OF Shane Victorino. May 19, 2016 Iowa Cubs placed OF Shane Victorino on the temporarily inactive list. May 6, 2016 OF Shane Victorino assigned to Iowa Cubs. March 29, 2016 Chicago Cubs signed free agent OF Shane Victorino to a minor league contract. March 29, 2016 Chicago Cubs released LF Shane Victorino. February 26, 2016 Chicago Cubs signed free agent LF Shane Victorino to a minor league contract and invited him to spring training. November 2, 2015 LF Shane Victorino elected free agency. July 28, 2015 Los Angeles Angels activated LF Shane Victorino. July 27, 2015 Boston Red Sox traded LF Shane Victorino and cash to Los Angeles Angels for 2B Josh Rutledge. July 3, 2015 Boston Red Sox activated RF Shane Victorino from the 15-day disabled list. June 30, 2015 Boston Red Sox sent OF Shane Victorino on a rehab assignment to Portland Sea Dogs. June 24, 2015 sent OF Shane Victorino on a rehab assignment to Pawtucket Red Sox. May 11, 2015 Boston Red Sox activated RF Shane Victorino from the 15-day disabled list. May 8, 2015 Boston Red Sox sent OF Shane Victorino on a rehab assignment to Portland Sea Dogs. October 31, 2014 Boston Red Sox activated RF Shane Victorino from the 60-day disabled list. August 1, 2014 Boston Red Sox placed RF Shane Victorino on the 15-day disabled list retroactive to July 31, 2014. Lower back tightness. July 19, 2014 Boston Red Sox activated RF Shane Victorino from the 15-day disabled list. July 17, 2014 Boston Red Sox sent RF Shane Victorino on a rehab assignment to Pawtucket Red Sox. July 10, 2014 Boston Red Sox sent OF Shane Victorino on a rehab assignment to Lowell Spinners. June 24, 2014 Boston Red Sox sent RF Shane Victorino on a rehab assignment to Pawtucket Red Sox. June 23, 2014 Boston Red Sox sent RF Shane Victorino on a rehab assignment to Lowell Spinners. June 14, 2014 Boston Red Sox sent RF Shane Victorino on a rehab assignment to Pawtucket Red Sox. April 24, 2014 Boston Red Sox activated RF Shane Victorino from the 15-day disabled list. April 19, 2014 Boston Red Sox sent RF Shane Victorino on a rehab assignment to Pawtucket Red Sox. June 8, 2013 sent RF Shane Victorino on a rehab assignment to Pawtucket Red Sox. June 8, 2013 Boston Red Sox activated RF Shane Victorino from the 15-day disabled list. June 6, 2013 Boston Red Sox sent RF Shane Victorino on a rehab assignment to Pawtucket Red Sox. May 24, 2013 Boston Red Sox placed RF Shane Victorino on the 15-day disabled list retroactive to May 21, 2013. Left hamstring strain. December 13, 2012 Boston Red Sox signed free agent RF Shane Victorino. 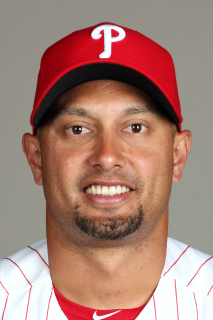 November 3, 2012 LF Shane Victorino elected free agency. August 1, 2012 Los Angeles Dodgers activated LF Shane Victorino. July 31, 2012 Philadelphia Phillies traded CF Shane Victorino to Los Angeles Dodgers for RHP Josh Lindblom and RHP Ethan Martin. July 19, 2011 Shane Victorino roster status changed by Philadelphia Phillies. July 16, 2011 sent CF Shane Victorino on a rehab assignment to Reading Phillies. July 8, 2011 Philadelphia Phillies placed CF Shane Victorino on the 15-day disabled list retroactive to July 4, 2011. Ligament sprain in his right thumb. June 3, 2011 Philadelphia Phillies activated CF Shane Victorino from the 15-day disabled list. May 31, 2011 Lakewood BlueClaws sent CF Shane Victorino on a rehab assignment to Reading Phillies. May 28, 2011 Shane Victorino assigned to Lakewood BlueClaws. August 12, 2010 Philadelphia Phillies activated CF Shane Victorino from the 15-day disabled list. August 10, 2010 sent CF Shane Victorino on a rehab assignment to Lehigh Valley IronPigs. July 28, 2010 Philadelphia Phillies placed CF Shane Victorino on the 15-day disabled list. Abdominal strain on his left side.